Were hung by the Vigilance Committee at precisely twenty minutes after one o'clockthe former for the murder of James King of Wm., and the latter for the murder of Gen. William H. Richardson. Both persons had been tried before the Committee, and found guilty. A promise had been made to Casey that he should have a fair trial, and be permitted to speak ten minutes. These conditions had doubtless been observed. Casey was informed on Wednesday afternoon, that he had been condemned to be hung. While under charge of the Vigilance Committee his spirit appeared to be unbroken. When awaken, after a sleep, he would frequently strike the floor with his hand cuffs, and swear fiercely at his fate. During the evening previous to his execution, the Right Rev. 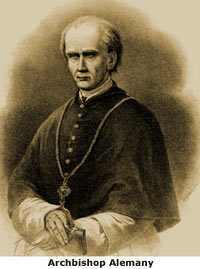 Bishop Alemany attended Casey, who had been educated in the Roman Catholic religion. During the night he was restless, and passed a portion of the time in pacing his room. Cora attracted less attention, and conducted himself more quietly. At eight o'clock, on Thursday morning, the General Committee was notified that Casey and Cora would be executed at half-past one, and ordered to appear under arms. During the morning preparations were made for the execution. Beams were run out over two of the windows of the Committee Room, and platforms about three feet square extending out under each beam. These platforms were supported next the house by hinges, and outside by ropes, extending up to the beams. Along the streets, for a considerable distance on each side of the place of execution, were ranged the Committeemore than three thousand in numbersome on foot with muskets, and others on horseback with sabres. No outsiders were permitted to approach within a hundred yards. Beneath the place of execution were several cannon and caissons ready for use if necessary. The houses in the vicinity were covered with spectators; and in the streets were collected, probably, not less than eight or ten thousand persons. "Gentlemen, Fellow Citizens:I am not guilty of any crime. When I am dead, when I am laid in my grave, let no one dare traduce my character or asperse my memory. Let no man exult over me, or point to my grave as that of an assassin. I am guilty of no crime. I only acted as I was taughtaccording to my early educationto avenge an insult. Let not the Alta, the Chronicle, and the Globe, persecute my memory; let them no more proclaim me a murderer to the world. Let them not insult me after death. I have an aged mother in the Atlantic States, and I hope that she will never hear how I died. I trust she will never know I am executed on a charge of murder. I am not guilty of any such crime." About this time Father Gallagher touched Casey, and said: "Pray to God to pardon you for your crime; pray God to save your soul." "Oh, God, pardon and forgive me. Oh, my mother! my mother! I hope she will never hear of this. On, God! have mercy on my mother; comfort her in her affliction. Oh, God, have mercy on my soul! Oh, my God! my God! I am not guilty of murderI did not intend to commit murder." After he had concluded, the noose was again adjusted, his eyes bandaged, and as he was about to step forward, he faltered, and was about to sink, when the arms of two men were extended and supported him to the fatal spot. Both prisoners being prepared, the signal was given, and, at the same moment, the souls of James P. Casey and Charles Cora were launched into eternity; and their bodies became an inanimate mass of corruption. Neither of them struggled much, Casey showing the most physical suffering. From the time the prisoners appeared at the window until the drop fell, the immense mob of people stood uncovered, and the utmost silence was maintained, not a shout being heard or a loud word spoken. The bodies continued to hang for nearly an hour as they were executed. Although a great many persons were in sight at the time, awaiting the climax of the tragedy, there were many others scattered about town, who had supposed the affair was postponed. The news spread rapidly through the city, and in ten minutes after the death of Cora and Casey, great numbers of men were to be seen rushing down Clay, and Washington, and Commercial streets, as though it were a matter of life and death to get a sight of the spectacle. The bodies were then taken down and handed over to the Coroner.